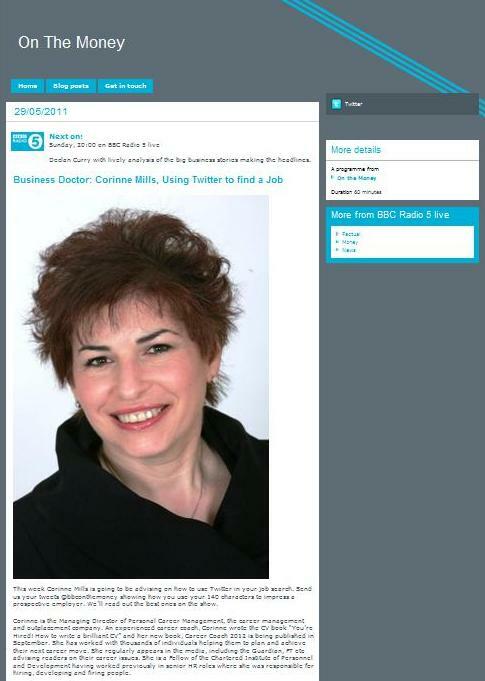 Corinne Mills, MD of Personal Career Management will be speaking on the Radio 5 Live ‘on the money’ programme on Sunday 29th May 2011 at 8pm on this week’s feature of ‘Tweet yourself a job’. Corinne (@corinnemills) will be looking at Twitter and other social media applications and how you can successfully use them as part of your job search strategy. She will be giving her top tips on the show and will be tweeting all week giving followers a taste of what’s to come. When looking for a new job, Twitter, LinkedIn and Facebook have become a vital part of the job search process and should not be avoided. On this week’s programme job seekers will have the opportunity to Tweet in with what they do and why someone should employ them. The best Tweets will be read out on the show so get tweeting now @BBCOnTheMoney. For more information on this feature please see the BBC Radio 5 Live website. Don’t forget to follow @corinnemills on Twitter to receive up to date career tips on social media and other aspects of career management. See Corinne’s top tips for using twitter in your job search in our career tips section of our website.